Gladys Noon Spellman rose through the ranks of Maryland politics to become an influential advocate for the federal workforce in the U.S. House of Representatives. Elected in 1974 to a large freshman class of Democrats, Spellman joined the front ranks of the “freshman revolt” bent on reforming con–gressional practices. Very quickly, however, she settled into a role as a Representative dedicated to district work, securing what had been a tenuous first victory.1 Within a short span of six years she became a widely popular local politician in the Maryland suburbs of Washington, D.C., before suffering a heart attack that left her permanently incapacitated. She was born Gladys Blossom Noon in New York City on March 1, 1918, daughter of Henry and Bessie Noon, and was educated in the New York City and Washington, D.C., public schools.2 After attending George Washington University and the graduate school of the U.S. Department of Agriculture, Spellman taught in the public schools of Prince George’s County, Maryland, a suburban area northeast of Washington, D.C. Gladys Noon married Reuben Spellman, and they raised three children: Stephen, Richard, and Dana. Gladys Spellman made her mark as a crusading Parent Teacher Association leader before winning election to the Prince George’s County board of commissioners in 1962. At first, she faced a cool reception from her colleagues. One remarked, “You think just like a man.” Spellman took that as a compliment, at first. “Then I got angry and said, ‘Well, I guess today was an off–day for me. Tomorrow I’ll be myself and do better.’”3 A county executive recalled years later that his nickname for Spellman—“Madame Tinkerbell”—derived from her ability to use her ebullient personality, her broad smile, and her uncanny ability to recall names to engage voters and work a room.4 She was re–elected in 1966 and chaired the board for two years, the first woman ever to lead the county. In 1970, when Prince George’s County changed to a charter form of government, Spellman won election to the county council as an at–large member, serving from 1971 to 1974. In 1974, when U.S. Representative Lawrence J. Hogan declined to run for re–election in order to seek the party’s nomination as Maryland gubernatorial candidate, Spellman entered the race to succeed the three–term Republican. Historically, the congressional district which wrapped around Washington’s northern and eastern suburbs and swung into southern Maryland had been solidly Democratic since the mid–1920s. To the south and east it was composed of farms and rural communities, while on the northern and western side it was made up of suburban communities wedged between the capital and Baltimore. The federal government, which had major installations in the district, employed a large number of workers. Only two Republicans ever had held the seat: a one–termer who rode Dwight D. Eisenhower’s presidential coattails in 1952 and Hogan who won in 1968 when Richard Nixon and Maryland native son Spiro Agnew made up the winning GOP presidential ticket (they nearly carried Maryland as well and, in 1972, won it convincingly). Spellman entered the House as one of seven leaders of the so–called “freshman revolt” of the class of 1974, which sought to extend reforms of congressional procedure to secure better committee assignments for first–term Members and to weaken the power of committee chairmen. Spellman was appointed to the Democratic Steering and Policy Committee, a panel reinstituted in 1973 to allow party leaders to assert more control over the committee assignment process and to shape legislative policy.9 Congresswoman Spellman avowed, “We may be new kids on the block, but we’re not stupid”—an allusion to her frustration with chairmen who underestimated the expertise and clout of freshman “Watergate Babies.”10 Many reforms already had been pushed through at the end of the preceding Congress and, in January 1975, the freshmen Members of the 94th Congress (1975–1977) provided momentum to help depose three entrenched southern committee chairmen and appoint new Members to prominent committees. During her three terms in Congress, Spellman served on the Committee on Banking, Currency, and Housing (renamed the Banking, Finance, and Urban Affairs Committee after the 94th Congress) and the Committee on Post Office and Civil Service. 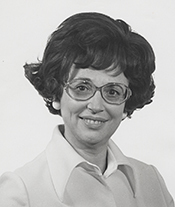 In 1977 she favored legislation to establish a bank to make loans to cooperatives owned by consumers and legislation to extend the federal revenue–sharing program. She also voted in 1975 for $7 billion in loan guarantees to aid financially troubled New York City. On October 31, 1980, two days before the general election in which she was re–elected to a fourth term, Spellman suffered a severe heart attack. She survived but lapsed into a coma from which she never regained consciousness.16 House Resolution 80, passed on February 24, 1981, declared Spellman’s seat vacant, since she was unable to discharge the duties of her office. It marked the first time the House had ever vacated the seat of a Member who had become mentally or physically impaired. The next day the Washington Post, while observing that the move “was only right” for representation of her district, celebrated Spellman’s “brilliant” career: it “remains a classic for all who would seek public office and serve successfully.”17 Her husband, Reuben, was a Democratic candidate in the April 1981 special primary to choose nominees to succeed her. He finished second out of a field of six candidates; the winner of the primary, Steny Hoyer, also won the general election. Gladys Spellman died in Rockville, Maryland, on June 19, 1988. 1Karen DeYoung, “They Say Gladys Spellman Is as Good as She Says,” 25 October 1976, Washington Post: B1. 2Parents’ names come from Spellman’s death notice, printed in the 21 June 1988, Washington Post: B4. 3Karen Foerstel, Biographical Dictionary of Congressional Women (Westport, CT: Greenwood Press, 1999): 260. 4Bart Barnes, “Former Md. Representative Gladys N. Spellman, 70, Dies,” 20 June 1988, Washington Post: A1. 5Douglas Watson, “Barbara Mikulski Scores Big in Md. Primary,” 12 September 1974, Washington Post: B1. 6Charles A. Krause, “Speaker of House Aids Md. Candidate,” 13 September 1974, Washington Post: A10; Charles A. Krause, “Sen. Kennedy Makes Big Hit as Backer of Mrs. Spellman,” 7 October 1974, Washington Post: C5; Donald F. Baker, “Hogan Campaigns for Burcham,” 28 September 1974, Washington Post: D4. 7Douglas Watson, “Watergate Hurt GOP in Nearby Md.,” 28 October 1974, Washington Post: A1. 8“Election Statistics, 1920 to Present,” http://clerk.house.gov/member_info/electionInfo/index.aspx. 9Richard L. Lyons, “Democrats Eye Reform in the House,” 5 January 1973, Washington Post: A1; Julian E. Zelizer, On Capitol Hill: The Struggle to Reform Congress and Its Consequences, 1948–2000 (New York: Cambridge University Press, 2004): 137–138. 10Richard L. Lyons, “Freshmen Assess House Chairmen,” 14 January 1975, Washington Post: A2. 11Helen Dewar, “Rep. Spellman Drops ‘Freshman Revolt’ for Political Survival,” 27 July 1975, Washington Post: 21. 13Cynthia Gorney, “Spellman Will Seek Re–election,” 7 March 1976, Washington Post: 25. 14“Election Statistics, 1920 to Present,” http://clerk.house.gov/member_info/electionInfo/index.aspx. 16See, for example, “Friends of Spellman Mourn Life Lost in Coma,” 15 October 1987, Washington Post: MDA5. 17“Gladys Spellman’s Brilliant Career,” 25 February 1981, Washington Post: A16. Papers: In the Candidates for Public Office Campaign Materials, 1966-1976, 0.5 linear foot. Subjects covered include Gladys Noon Spellman. Papers: In the Saul J. Harris papers, ca. 1968-1978, 0.5 linear foot. The papers contain transcripts from public debates between Saul Harris and Gladys Noon Spellman, notes on Harris's speeches and his positions on issues, in particular taxes and inflation. The papers also contain a profile of Gladys Noon Spellman as well as her financial information during the 1978 campaign. "Gladys Noon Spellman" in Women in Congress, 1917-2006. Prepared under the direction of the Committee on House Administration by the Office of History & Preservation, U.S. House of Representatives. Washington: Government Printing Office, 2006.